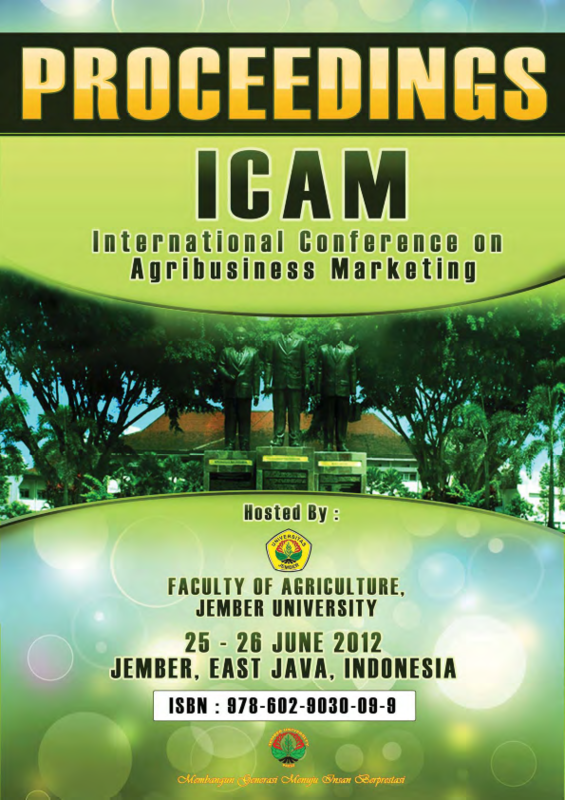 The International Conference on Agribusiness Marketing (ICAM) aims to explore and map various opportunities for agri-food industry especially in emerging markets within the internationallyintegrated and globalized economic environment while identify challenges likely to be faced. The papers in this proceedings were presented in the ICAM which was held in Jember University, Jember, East Java, Indonesia from 25 to 26 June 2012. It consists of papers from the keynote speakers and more than 70 contributed papers from the conference attendances. Finally, it is expected that all papers and outcomes produced in this conference can contribute, both theoretically and practically, to the future of agribusiness and marketing of agricultural products especially in the developing world. SYSTEM OF RICE INTENSIFICATION (SRI) PRODUCT VALUE ADDED AND DISTRIBUTION CHANNEL ANALYSIS Case Study of Handling and Post Harvesting Processes in Sudimoro, Megaluh, Jombang. RICE SUPPLY CHAINS IN INDONESIA: HOW DO THEY WORK? AN ANALYSIS ON FINANCIAL FARMING EFFORT WORTHINESS OF KEPOK BANANA (Musa paradisiaca L. cv. Kepok) IN MALINAU SEBERANG VILLAGE, SUB – DISTRICT NORTH MALINAU, MALINAU DISTRICT.